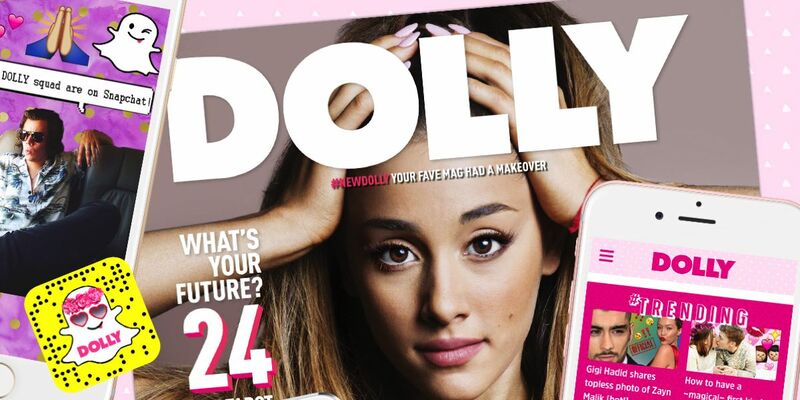 Bauer Media relaunches teen girls magazine Dolly as a bimonthly with a mobile-first approach. The publisher tags the move as the first major change in the title’s 46-year history. Bauer Media has today relaunched iconic teen magazine Dolly with a new mobile first strategy in what is the biggest change in the title’s 46-year history. The reinvention comes as Bauer research shows that more than ninety per cent of Dolly’s 14-17 year old target audience engages with the title via their smartphones. The new and improved dolly.com.au has been designed as a fully responsive on demand mobile site that speaks to teens on the platforms they interact with the most. While still having all the same breaking celebrity news, fashion, beauty, and lifestyle content, dolly.com.au boasts new features including a custom quiz platform and emoji reactions. Video is central to the new digital strategy with content produced in a purpose built Dolly studio. In-read native video advertising platform Teads will offer offer advertisers enhanced engagement opportunities with consumers. “We pride ourselves on knowing our audience, the kind of content they engage with and the forms they enjoy consuming it in. That’s why we’re putting video to the heart of our editorial strategy,” said Emily Kerr, Dolly digital managing editor. Dolly has also launched on Snapchat to leverage all of the key social media channels, as its consumers’ demand even more sharable content. In addition to the enhanced dolly.com.au, the reimagined magazine goes on sale today. The new perfect bound bimonthly still reflects the same DOLLY ethos but will include longer reads with deeper content on celebrity, lifestyle and relationships. Fans of the Dolly posters will not be left wanting with poster books published every other month. And the hugely popular DOLLY Doctor will continue to run across both print and digital. Dolly publisher Marina Go said: “When Dolly was launched in the 1970s there were very different consumer expectations to those of today. DOLLY has remained the number one magazine for teenage girls throughout that time but our readers have told us they want the great content we deliver to them in the format and on the platforms they engage with the most.